Designed for removing air from water. 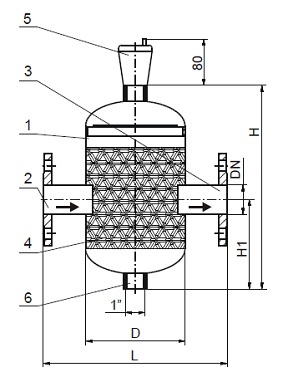 Used in heating systems at the highest temperature point (downstream of the boiler or heat exchanger). 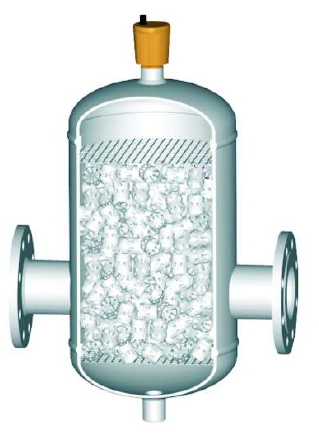 Air separators reduce system corrosion, extend pump life by reducing cavitation, flow noise and system noise. Low-carbon steel cylindrical tanks with external paint coat finish (acid-resistant steel version available). Inlet (2) and outlet (3) ports in the shell (1) for circulation pump. Special ring (4) insert for removing air from water. Automatic air relief valve (5) in the top section. Cleaning via drain valve port (6) in the bottom section. Heating medium is discharged via port (2) to the tank. The flow rate is reduced inside the tank. The air bubbles and micro-air bubbles settle on the ring (4) walls. The air is removed to the top tank section and discharged via the automatic air relief valve (5). Air-free heating medium is discharged via port (3). mark as per relevant regulations (depending on T, p, V).